The following race gallery and updates were provided by National Trails Guide correspondent Susie Stevens-Briody. Photos courtesy of Iditarod.com, Iditarod Trail Committee, Iditarod Insider Team & KTVA (Anchorage), Terrie Hanke and Sebastian Schnuelle (‘Armchair Musher’/former racer). It’s time for the Last Great Race on Earth again in Alaska! The Iditarod began on Saturday in Anchorage with the Ceremonial Start; then the official start Sunday from Willow . This year’s race has 85 mushers with their wonderful teams of canine athletes ready to race almost a thousand miles to Nome. The mushers range in age from 19 to 75, with some having raced in the Iditarod 15 or 26 times and 17 rookies experiencing it for the first time. Racers have come from Canada, Norway and Sweden as well as the U.S. 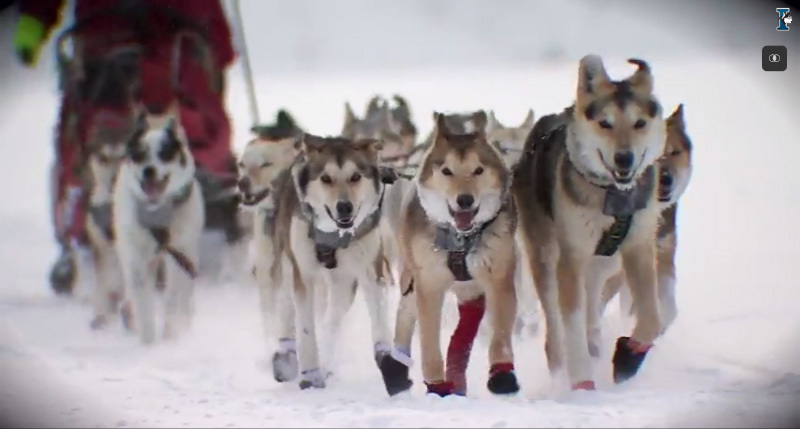 The race began in 1973 to honor the historical freight route to Nome and commemorates the part that sled dogs played in the settlement of Alaska. The mushers travel from checkpoint to checkpoint much as the freight mushers did eighty years ago. But now there are colorful booties, veterinarians to check each sled dog, mandatory layovers, lots of volunteers, delivery of supplies, tv coverage and GPS units! Last year’s winner, Dallas Seavey, finished the race in 8 1/2 days, and it took several more days for the remaining racers to complete this difficult trail. 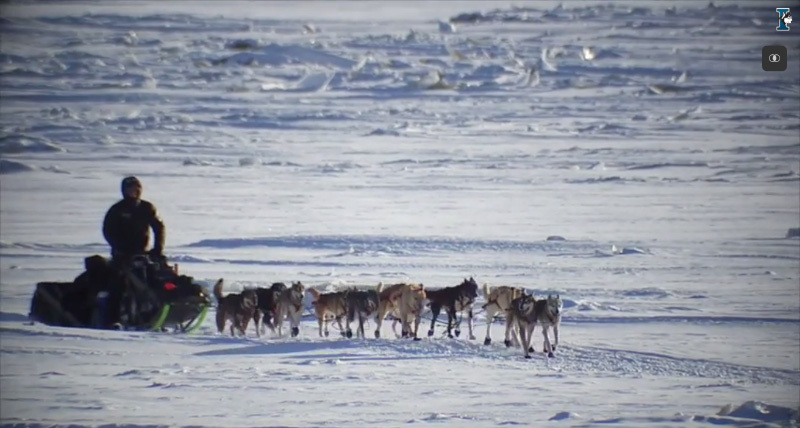 Dallas Seavey was the first musher of the 2016 field to reach McGrath. Reporters felt “the team was smart looking and spirited.” Prizes are given along the route at certain checkpoints. At McGrath, Danny Seybert of PenAir presented the Spirit of Alaska Award. This consists of a $500 voucher for travel or freight on any of Pen Air’s routes in AK and an original spirit mask created by Bristol Bay artist, Orville Lind. The center of the mask has a figure that’s half dog and half human in the belief that during the Iditarod race the musher and dogs become one. 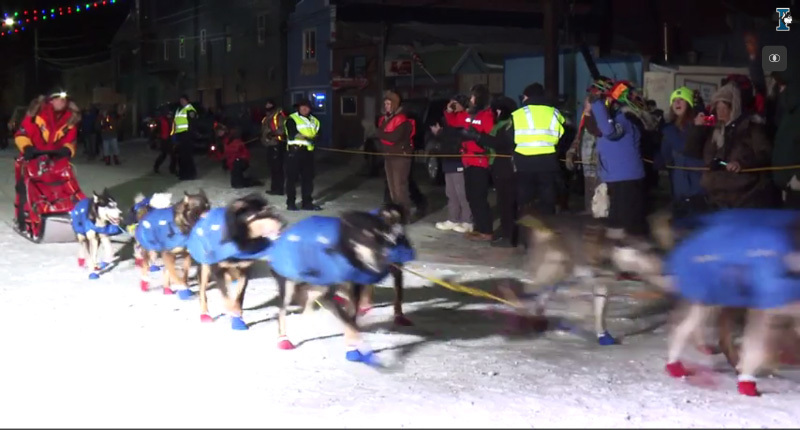 Mitch Seavey, Dallas’ father, comes in at second place in Nome, followed by Aliy Zirkle. All the teams keep a run-rest-run schedule with the top teams traveling 10-11 mph and 7 teams had scratched by this point for varying reasons. The Iditarod Race goes through 3 different areas: it runs along the Alaska Range, then drops into the Yukon and finally goes along the coastline of the Bering Sea. The first team to arrive at the Bering Sea checkpoint of Unakleet wins the Wells Fargo “1st to Bering Sea’ award. Wells Fargo awards $3,500 in Gold nuggets as well as the musher’s name engraved on a perpetual trophy. The winner this year was Brent Sass. Dallas Seavey receives the Spirit of Alaska Award. Day 6 of the Last Great Race on Earth, the Iditarod: Kaltaq is the checkpoint at mile 629 of the Trail, and it is 2/3 of the way to Nome. Racers have come 130 miles down the frozen Yukon River, which is nearly a mile wide with the Trail about 40 feet across. The first team arriving was Mitch Seavey — father of last year’s winner, Dallas — and received the Bristol Bay Native Corporation’s Fish First Award ($2,000 and 25 lbs. of fresh Salmon fillets “when the salmon run starts”). He then had to take the mandatory 8 hour layover for his team. Having finished their required 8 and 24 hour layovers, the top 3 teams leaving Kaltaq for the ‘run to the coast’ (85 miles away) were Brent Sass, Aliy Zirkle and Dallas Seavey. Day 9 – After 12 teams had to scratch, it left 73 to continue west. Of those, the top 4 teams raced on around the coastline, with some back and forth changes in the lead. 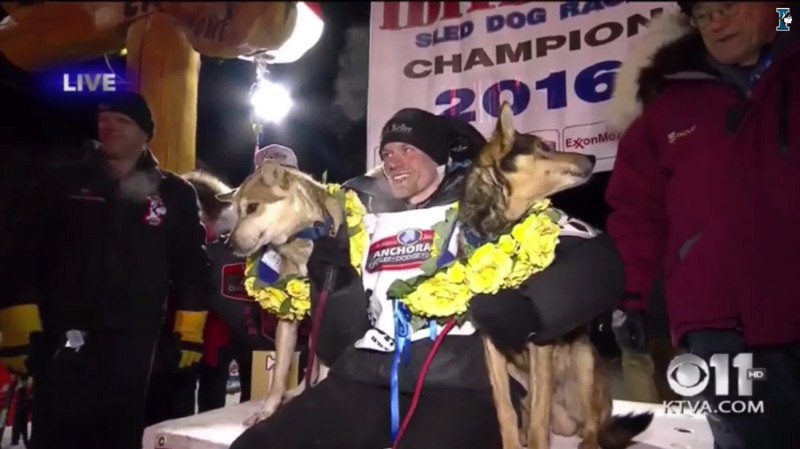 In that foursome of teams was the father and son Seavey duo, the winner of the recent ’16 Yukon Quest race, Brent Sass and fan favorite Aliy Zirkle. 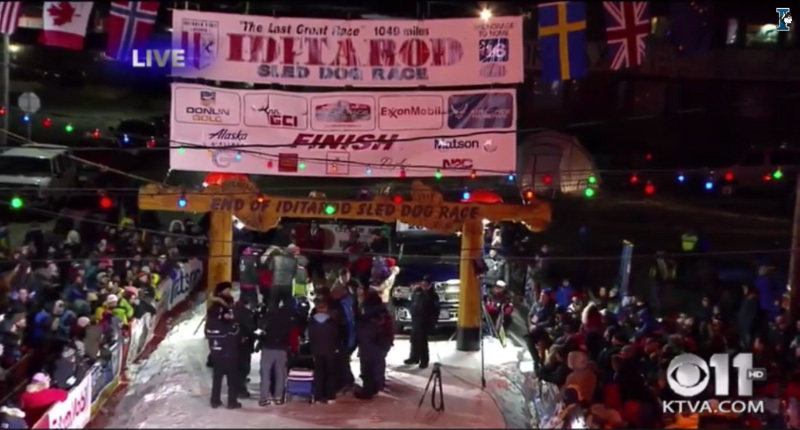 They continued a close heated race until Dallas took the lead and then kept it through White Mountain and Safety to Nome, finishing as his team ran through the historic Burled Arch to the end of the 44th Iditarod! The finish line on March 15, 2016. Dallas Seavey was the 2016 Winner of the $75,000 prize money, as well as a brand new vehicle of his choice from Anchorage Chrysler Dodge Jeep. He arrived at 2:20 a.m. with a record setting time of 8 days, 11 hours and 20 minutes. The Iditarod is really a family and generational event with his grandfather competing in the first race in 1973, then his father and brother and now this is Dallas’ 4th win in 5 years. Congratulations to Dallas and his great team of canine athletes. *Note: Unfortunately, this year there was an unprecedented snowmobile accident involving two of the teams by a man struggling with substance abuse issues. A sled dog, Nash, was killed and two other dogs were injured. The suspect was caught by police and is facing multiple charges. 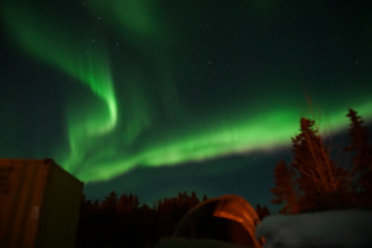 Northern lights in Elim, Alaska.